An Introduction to Gretna Green - Who Are Gretna Green - What Makes Us Famous? Why is Gretna Green Famous? Gretna Green is a village on the Scottish border that is world famous as a romantic wedding destination. First, over the border, it became a haven for young lovers following the 1754 Marriage Act introduced in England and Wales. You were forbidden to marry without your parents' permission if you were under 21. So the young and in love began eloping to Scotland, where it was much easier to marry. What is Gretna Green today? Now fondly recognised as a romantic wedding destination, you can still marry in three historic marriage houses: two that give you Gretna Green on your marriage certificate and one that gives you Gretna on your certificate. Gretna Green is synonymous with Anvil Weddings and it is the Famous Blacksmiths Shop where the tradition of an Anvil Wedding began. Legend has it that if you touch the famous Gretna Green anvil it brings you good fortune in affairs of the heart. It was here that the blacksmith would repair and make tools for the farms and shoe the horses. 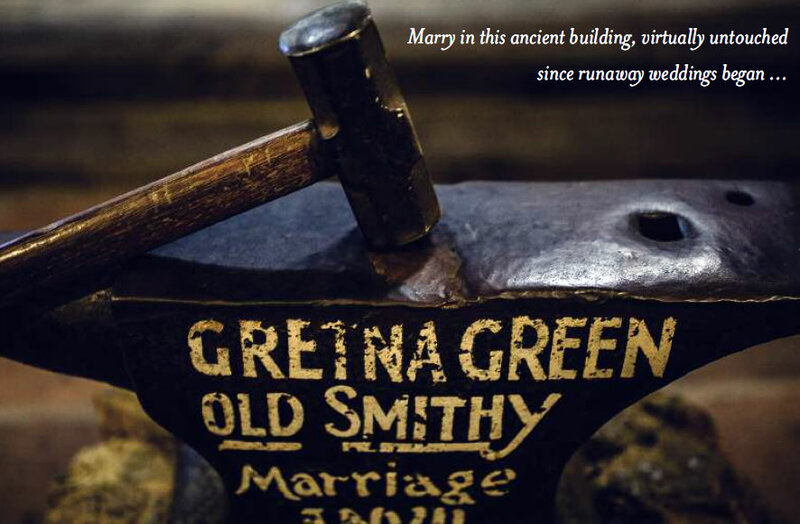 From 1754 the blacksmith in Gretna Green became notorious for a different kind of forging: joining couples in marriage. Marry in this ancient building, virtually untouched since runaway weddings began and full of magical charm. Also in Gretna Green is the manor house of Gretna Hall, built for Gretna Estate in 1710, and later a coaching inn in 1825, it was the first official stop in Scotland for travelling stagecoaches and private carriages. Gretna Hall was also frequented by run-aways desperate to marry but forbidden to do so back home. It witnessed many romantic elopements as a venue for aristocratic weddings. The picturesque courtyard of this majestic manor house is the venue for three atmospheric marriage rooms. The Old Toll Bar, Gretna, became part of the run-away wedding legacy in 1830, when a bridge was built over the Sark River, redirecting most of the traffic that way into Scotland. The resident toll-keeper in the First House in Scotland became very busy arranging marriages for the many desperate couples that arrived on his doorstep. 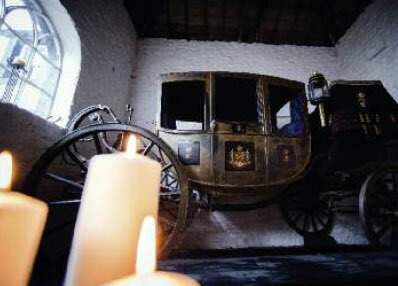 Today this intimate venue, steeped in history, creates a very special experience for your wedding day.